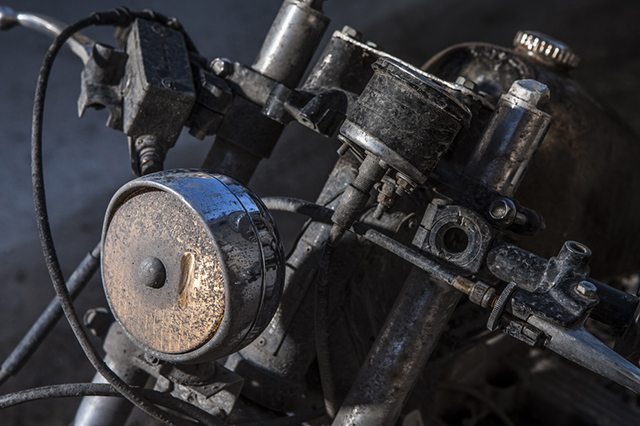 Some people like lots of shiny chrome on their pride and joy, while others prefer the aged look of patina. Today’s bike firmly falls into the second category – with a finish that looks like it was pulled from a swamp. 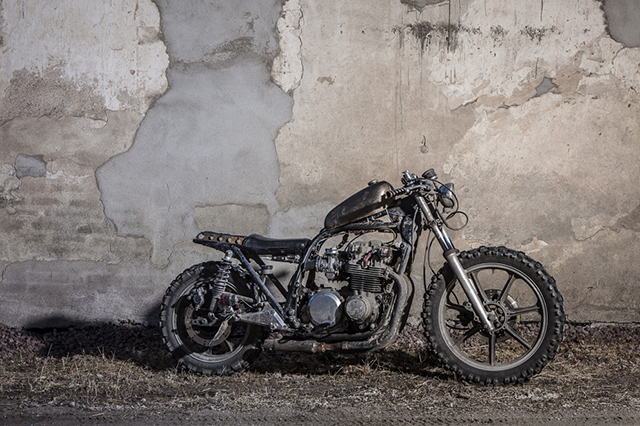 The builder, Janne Martola is an artist hailing from Finland, his artistic expertise being built into this well worn Kawasaki 750LTD. Buying it as a non runner three years ago, Janne has spent the last three years fine-tuning the machine – both aesthetically and mechanically – in a manner which appealed to his tastes and budget. Used as an expedition machine for Janne’s to access places of an interesting nature, this bike is a custom which is ridden hard. On occasion the Kwaka has to pass for a scrambler in it’s duties, and this it does admirably for a bike that was so vanilla when it left the factory. Built in a small garage on a shoestring budget, the bike may not appeal to everyone’s taste but it is definitely a custom in the truest sense of the term. And the fact it’s an everyday rider makes it all the more interesting. 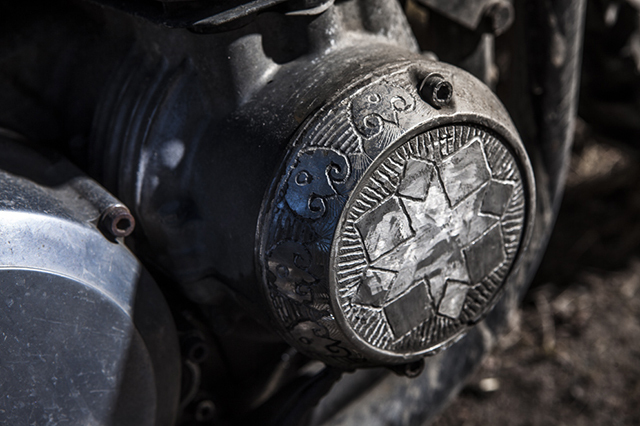 But you can probably tell that from the patina. 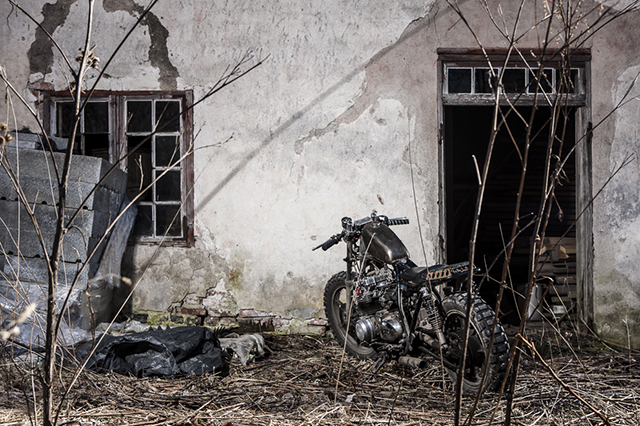 Three years ago, Janne acquired the broken down LTD and got to work bringing it back to life. With much consultation from an “old English vagabond” named Jonathan Wesley, Janne learnt up on how to rebuild engines. The engine was stripped down and the cylinder head sent to a machine shop for repairs. After some aluminium welding, new valves & guides fitted and clearances set, the hunt was on for a new bottom end. Luckily, Janne happened to be friends with a fellow named Raato – a hermit and Kawasaki guru living in the Finnish countryside. Raato had a complete bottom end from a wrecked Kwaka that could be used in the build. Raato built one complete perfect motor from the two donors, putting life into the LTD’s powerplant. Once the engine was fitted Janne got to work on the exhaust, assembling the system using the smallest silencers he could find. To make up for the change in exhaust back pressure, a larger set of needles were fitted to the carbs to get the bike running nicely. The system works together well, with Janne describing the running sound of the stunningly decrepit machine as ‘perfect’. 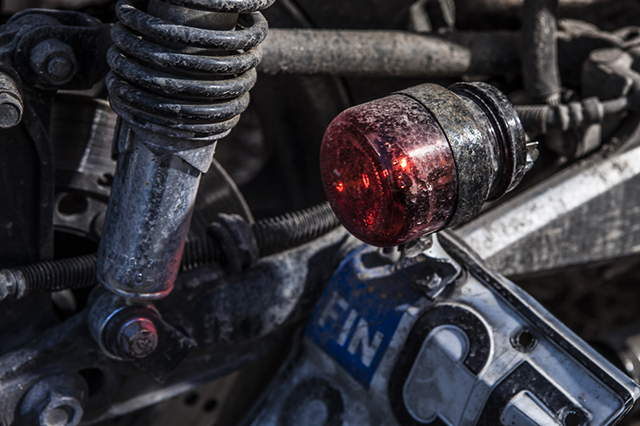 With Janne racking up miles on tarmac, dirt roads and narrow walking paths through the forest, the decision was made to fit knobby tyres during the build. Although warned against it due to the high amount of kilometres he would be travelling, Janne found knobby tyres to be a good choice for the mix of off and on road riding he would be doing. The LTD’s geometry makes for a good & upright riding position, and even with clip-ons is still very capable off road. The seat is Perspex, heated and moulded into shape, trimmed with fabric ripped from an abandoned Chinese scooter. 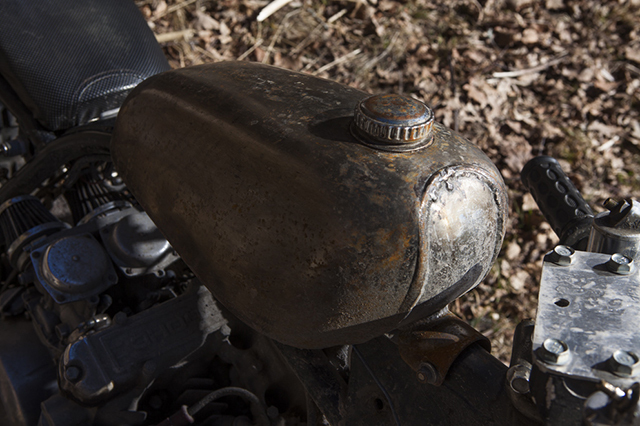 The fuel tank is from a 70s moped, both the fuel tank and luggage rack mounted with the assistance of Mikko the inventor. The finish on the bike is, as Janne puts it; “made free of covering paint and all unnecessary parts that make it disturbingly complex and heavy looking”. 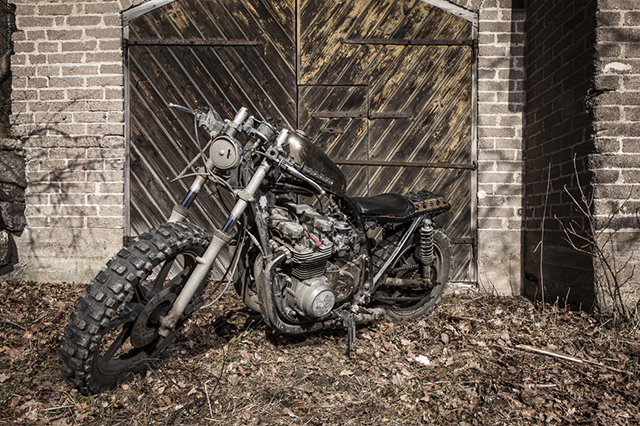 To round out the unique aesthetic this bike possesses, the tail light is a cut down baby food jar coloured using ink generally used in graffiti work. One of the most challenging parts of the build was the electrical system. With Janne flying blind in relation to auto electrics, he had to learn the basics in order to allow him to rebuild the electrical system the way he wanted to. This has allowed for the electrical harness to be split into two, a system for starting/running, and a system for lighting. The aluminium tray containing the majority of electrics is a recycled lunch box, with the battery a tiny lithium unit mounted under the seat. 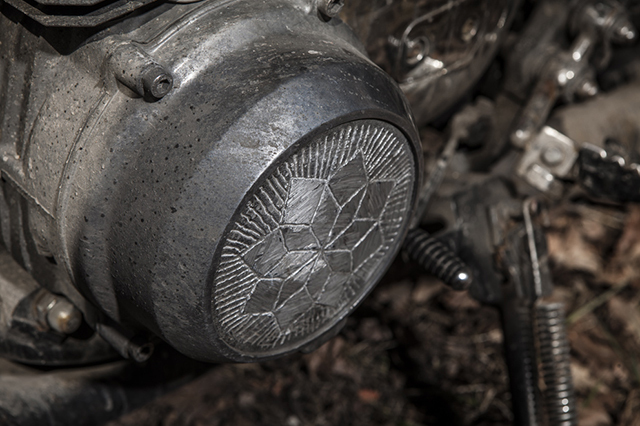 Headlight is from a Volkswagen Beetle – with a healthy coat of northern European road grime.